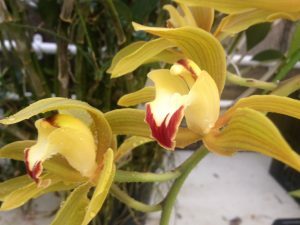 This is the seventh Cymbidium species to feature in the first 100 days of our blog which may show just how much we love this genus of large flowered and graceful orchids. 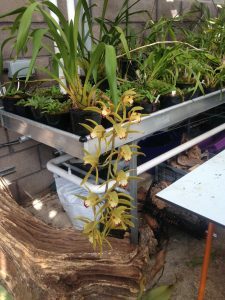 In fact we are working hard to raise as many Cymbidium species as we can from seed in-vitro as it appears that there are less and less available for enthusiasts. Cymbidium lowianum is native to Burma, Thailand, Vietnam and China where it grows as an epiphyte in cool montane forest. Cymbidium lowianum rows into a very large plant and has lovely large pseudobulbs, long thick leaves and very long arching flower spikes that naturally grow out to the side of the plant. We are keen to show off the natural grace of these flower spikes and so do not stake them – though that does have issues for space. Lowianum has been used extensively in Cymbidium breeding and the red V on the lip is a dominant feature that can be seen in many hybrids. One thing that can be frustrating with hybrids is the confusion about flower spike direction and a modern hybrid can easily contain Cymbidium insigne – spike straight up – Cymbidium devonianum – spike straight down – and Cymbidium lowianum – spike sticking out in an arch. I think we will stick with the species which all have an elegance that is hard to beat.